Daily Illuminator: I Call This One "Ode To A Black Shadow Of Ennui And Sorrow"
April 19, 2010: I Call This One "Ode To A Black Shadow Of Ennui And Sorrow"
A book called GURPS Classic: Blood Types. These creatures of GURPS Classic: Blood Types. 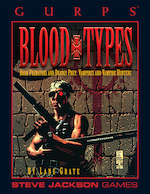 As outlined in GURPS Classic: Blood Types.